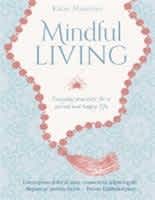 Join Katie Manitsas for a FREE 1 hour class, followed by a book launch to her latest creation: Mindful Living. Katie Manitsas is an advanced yoga teacher, a mum of four boys, an Ayurvedic practitioner, and so much more than can be put into writing. In addition she has passion for writing and has now published her 4th book; "Mindful Living". Katie was the director of Jivamukti Yoga Sydney. She is an advanced level Jivamukti Yoga Teacher and a Wise Earth Ayurveda master teacher. She is also qualified in Kundalini Yoga and as a doula (childbirth support person) and holds the highest possible accreditations with both Yoga Alliance and Yoga Australia. She has been teaching yoga for over 20 years. Katie’s passion is in yogic philosophy and the seasonal practices of sadhana – bringing devotion and a sense of the sacred to everyday life, as well as compassion for animals and a deep reverence for nature.